Plants. They surround us through all seasons. However, most of the time we walk past them while they remain silent, unnoticed, poised. They innocently mind their own business, drinking in the sun’s rays and waiting patiently to be watered. In general, although often extremely beautiful, often fascinating, and of course pleasant to have in one’s home, many plants blend into the background of human existence. Although we appreciate them, we also underestimate them. It is widely assumed that plants are a species that have the least awareness and intelligence in comparison to humans and animals. Yet some who are particularly fascinated by the species believe them to be cunning, manipulative creatures who have the ability to pose more harm to their counterparts, animals and humans than many other beings. Not only this, but they are understood to be masters of their own survival. These a-sexual creatures only have themselves to defend, and they therefore will act ruthlessly towards others to protect their own existence. Chris Thorogood guides us through the mesmerising world of these creatures through his new book, ‘Weird Plants’. These exotic plants, not found in any contemporary home and once sheltered away from the conventional world, are brought to the spotlight. Thorogood introduces us to these plants in a way never seen before. In the book, they are cleverly labelled as caricature’s that people typically fear the most: Vampires, Killers, Jailers, Accomplices, Hitchhikers, Fraudsters and Survivors. It is through the comparison to these figures that these plants gain a personality in our eyes, and a significant one at that. We are opened up to their instincts, motives and overall treacherous nature. Thorogood paints a full picture of the plants that have often been overlooked and dismissed as simply ‘weird’ looking, and draws us into the reasons behind their strange and perhaps quite frightening appearance. This isn’t a book about pretty wallflowers who sit on the sidelines waiting to be attended to. These are rude plants. They’ve got backbone. The book opens us up to a world where plants are seen in a new light. Where we have new insight into their true colours for the first time. ‘Vampires’ are parasitic plants which appear all over the world in climates as hot as tropical rainforests or as cold as arctic tundra. Their nickname refers to the similarity they bear to the fictional bloodsucking characters that are widely feared all over the world. Like vampires, these plants have the ability to attach themselves to other plants and extract water and nutrients for their own gain, among other terrifying yet brilliant talents. The Vampire lasso is known as a strangle-weed or witch’s hair. Found in locations such as the Canary Islands, The Dodder strangles and lassoes other plants and then steals from them. Just as a vampire will perish without the blood of others, upon finding a victim of interest, this cruel plant will wrap their stems around it and penetrate the stem (where the water and nutrients are held). At the end of the season, this plant will have spread themselves several metres across other plants in piles. When you hear the word ‘carnivore’ one would typically think of a meat-eating tiger or wolf. Then again, what if plants were as vicious as these predators? 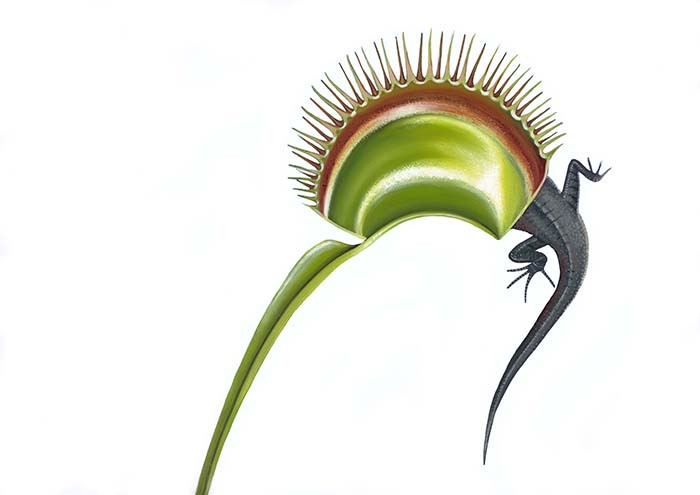 Carnivorous plants have been studied since the 19th century, the first observations being made by Charles Darwin. These Killers have evolved over time in environments where nutrients weren’t very accessible, for example, a swamp or mountain slope. As they have evolved, they have developed several different lures and traps in their biology to trap animal prey to satisfy their nutritional needs. Their exceptional structures are fascinating, to say the least, it is clear from these plants that they are masters of their own craft, and merciless with their intentions: to capture and kill. Although structurally this plant is rather simple, its intentions are anything but. This plant is known as the Pitcher of death. The leaves are foliar tubes up to 50 cm (20 inches) high, which attract insects through the nectar held inside them. 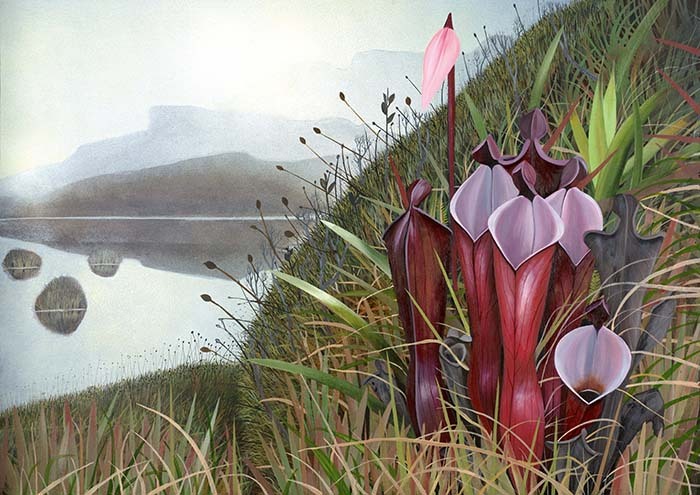 The Marsh Pitcher grows in South America, in a rainy location where there is a lack of nutrients and bleak mountains. 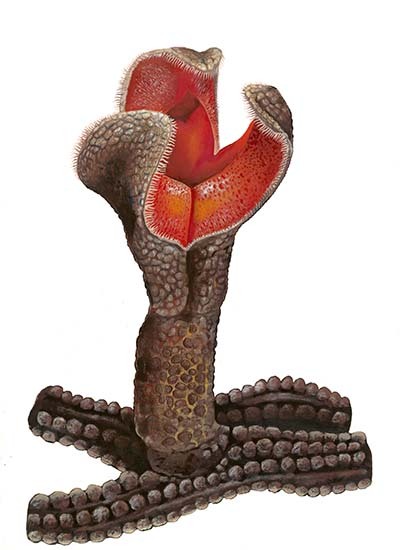 Within the plant, the hairs on the surface of the pitchers are wettable, and insects lose their footing and fall helplessly into the fluid at the base. Once inside these pitchers, these creatures are done for. One wouldn’t assume that a plant could have a mischievous streak. But Fraudsters do. These plants have evolved a range of mimicries to manipulate those who attempt to pollinate them. Many flowers who are insect-pollinated provide nectar in return, however many orchids like to deceive their pollinators, fooling them into thinking that a reward will be offered. The deception of Fraudsters works in different ways. For example, some use sexual deception, mimicking female insects as an attempt to seduce male bees, others like to play dead. 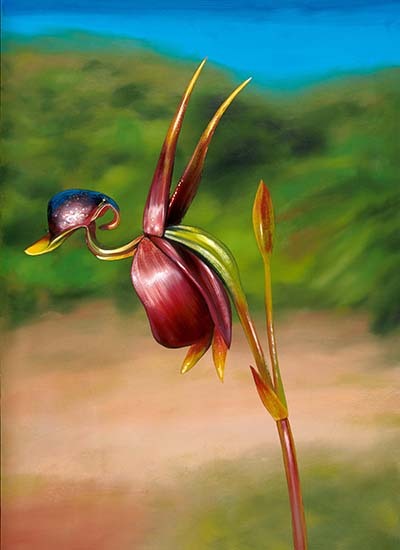 The flying duck orchid’s home is southern and eastern Australia. It strikingly resembles a duck taking off for flight. This orchid attracts male sawflies as the flower is mistaken for a female insect. The male sawfly therefore attempts to mate with them. Once the sawfly lands on the plant and then attempts to take off, it is tossed into the area of the flower where the pollen is located. The pollen attaches itself to the insect in a spot perfect for the next flower it visits. Plants are not unlike Jailers in their ability to imprison unsuspecting pollinating insects. As mentioned before, smell and appearance are the main attributes plants have when attracting insects. Many plants have specifically developed a design that encloses insects as if in a prison chamber, as they look for a place to lay their eggs. This process is known as trap pollination. On a high cliff-top overlooking the Mediterranean sea, is The dead horse arum’s natural habitat. This plant drapes its 40 cm-long (16 inches) blooms over the rocks. Its scent and appearance resemble a corpse to attract the local flies that swarm around the island. Once the flies come across a hollow chamber in the plant, while looking for a spot to lay their eggs they become trapped. They aren’t released from their imprisonment for 24 hours. Incredibly, plants are far superior to humans and animals in their ability to endure some of the most adverse environments in the world. Their survival tactics have evolved over time to deal with extremely dry desert conditions, with many desert plants having moist leaves and stems in which water is stored. Seeds are the main aspect of plants which makes them the most adapted survivors, as seeds can lie dormant for long periods, only germinating when the conditions are appropriate. This plant grows in the deserts near Namibia and Angola. 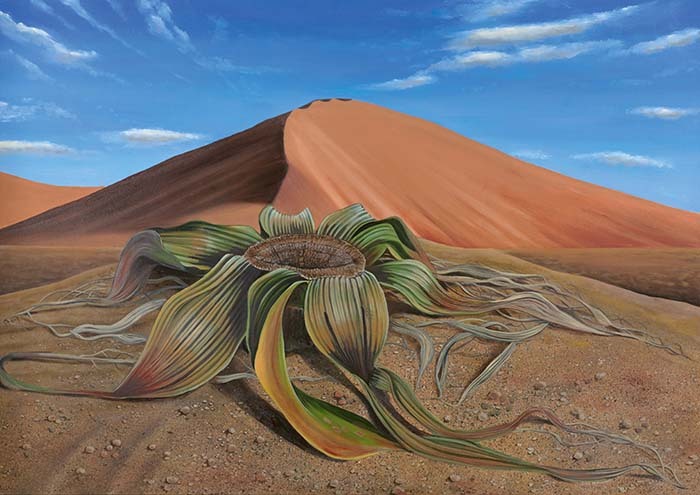 This plant is an ultimate survivor, with some of its relatives believed to have lived for 1,000 years. It’s most noticeable feature, is that it has two 2-4 m long leaves which grow throughout its life, only slightly fraying over time. As a-sexual creatures, the word ‘accomplice’ doesn’t come to mind when thinking of a plant. Most people assume they act alone, that they wouldn’t have communication with other creatures. Nevertheless, they use animals as their accomplices in a variety of schemes through which to secure their pollination. Some use ants to patrol their leaves in order to protect them, in return for a place to nest. Some have even formed mutual relationships with animals. This plant provides a perch for woolly bats to cling to. Amazingly, the plant’s pitchers have an opening that reflects the ultrasound calls of the bats. This allows the plant to be located under dense vegetation. The relationship between this plant and animal benefits both parties. While the bat can be assured of a safe place to roost, the plant is also nourished by the bat droppings, as this pitcher plant lacks nutrients in the forests where they grow. 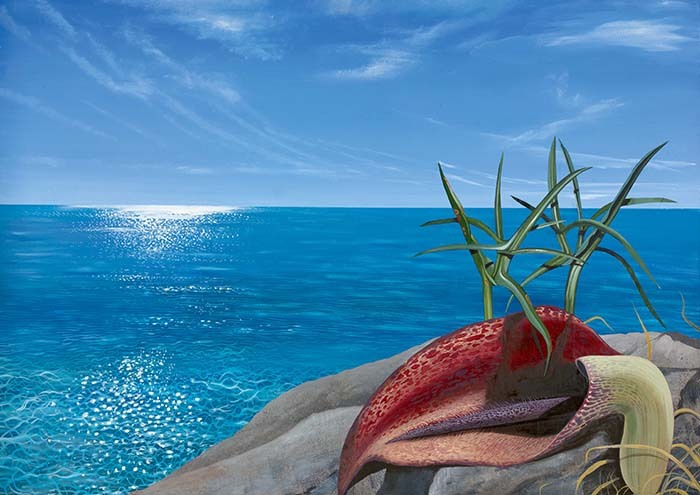 Plants appear to be the most immobile of creatures. However, this is not exactly the case. In fact, plants do have the capacity to move, but they do it in their own way. Some float on water to travel across the ocean. Some even have parachutes in which they use for wind dispersal. Of course, their main mode of movement is their ability to broadcast their overpowering smells across vast distances to attract animals who will then disperse their seeds. Often characterized as the king of the fruits, this plant is known for its overwhelming stench and flavour, which has been compared to rotting onions. This is the definition of a rude plant, it has even been banned in public transport and hotels. This rainforest hitch-hiker disseminates its odour over a vast distance to mammals such as orangutans and macaques. These animals act as ‘dispersal agents’ for this plant, as once they have eaten it, they are able to cover distances across the rainforest excreting the seeds and therefore continuing the plant’s existence. 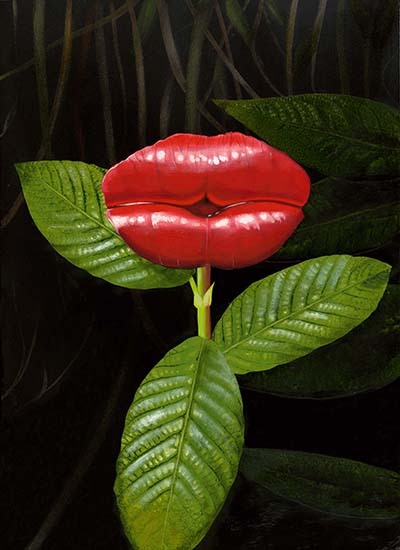 As discovered, these plants, although extremely strange looking, have motives with no one would have initially expected. Due to their unusual appearance, they have been sheltered away from society. They are repulsive to some, beautiful to others and of course, weird to most. Whatever you think of them, it cannot be denied: they are a force to be reckoned with.